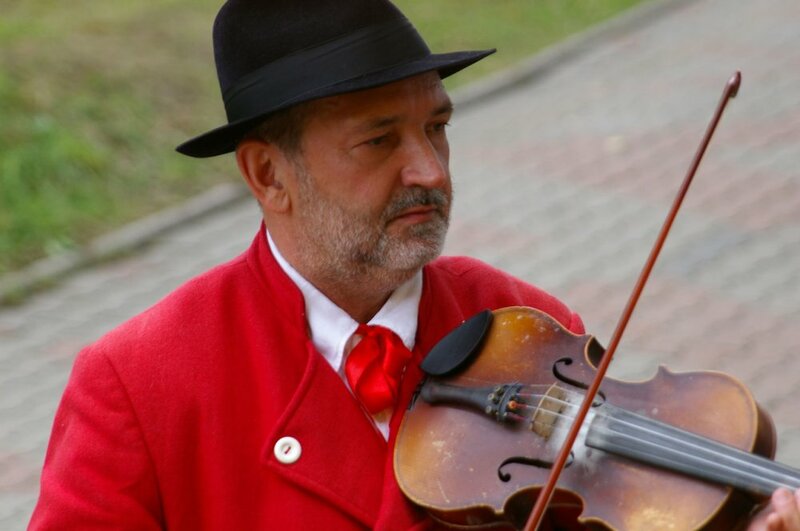 Leonard Śliwa was a fiddler and singer from Wolsztyn. Leonard Śliwa, born in Wolsztyn, Greater Poland, was a hydrological control technician by profession, a fiddler and a singer by heart, and a master and instructor of the kozioł (goat bagpipes) in the Region of Kozioł (Bagpipe) by vocation. I started playing music because I am a Śliwa, and for our family, playing has always come naturally. He was born in 1951 in Perzyny, the native town of the Śliwa family. It was the hometown of his great-grandfather Chryzostom, his grandfather Piotr (the oldest folk musician from the Zbąszyń area to be recorded by Łucjan Kamieński and Jadwiga Pietruszyńska-Sobieska), and of the fiddler and the bagpiper known as Uncle Tomek. Tomek teamed up in the 1950s with Antoni Janiszewski (both of them received the Oskar Kolberg Award) and others, to commence a programme aimed at preserving, documenting, and spreading the bagpiping tradition in an area that nowadays is called the Region of Kozioł (named after the local type of goat bagpipes). Their initiatives included founding the Association of Folk Musicians in Zbąszyń and the first class in Poland (at the Zbąszyń Music School) devoted to playing bagpipes, sierszenki (practice bagpipes, also used by shepherds) and mazanki (a violin-like instrument, but smaller, with 3 or 5 strings, often paired with bagpipes), as well as editing and publishing a handbook for playing bagpipe instruments. Leonard, a graduate of the StanisławMoniuszkoStateMusicSchool in Zbąszyń and vice-president of the Association of Folk Musicians, eventually became the continuator of his predecessors’ output. He was active in many different areas, and worked in an exceptionally creative and effective manner. Even though he learned the art of music through the prism of the fiddle (he received his first instrument at the age of five) and the three-string mazanki, he had always aspired to play in a wedding kozioł band (kozioł, fiddle, e-flat clarinet) combined with vocals – a fundamental component. He carried out his passion in a number of ways, from performing with many bands, e.g. the Franciszek Hirt group from Chrośnica, and with the Przyprostynia Wedding Regional Band, with whom he received numerous awards (in Kazimierz, Kopanica, Poznań, Węgrów, Wilczyna and Zbąszyń). As an entrepreneur, he often funded bagpiping workshops or other activities in the local area. Leonard Śliwa approached young musicians with great care and passion, including the graduates of his own alma mater who didn’t work professionally – he infected them with his admiration for local traditions, and introduced them to the disappearing sounds of the black kozioł and sierszenki, the charm of the old ditties and carols (the band Pastuszkowi Grocze spod Zbąszynia/The Shepherd Musicians from the Zbąszyń Area), and to the beauty of the Uprising songs and Passion chants (Our Passion, 2004). This not only meant the never-ending individual classes and workshops in Babimost, Chrośnica, Dąbrówka Wielkopolska, Nowy Kramsk, Przyprostynia, Siedlec, and Zbąszyń he gave throughout the year, but also schooling soloists and setting up bands. His efforts resulted in an increasing ratio of young and adult musicians from the Region of Kozioł at the local cympers (end of carnival parties), weddings, dozhinki (harvest festivals), Bagpiper’s Shrove Tuesday celebrations (dudaskie ostatki) in Podhale, Slovakian bagpipe festivals, and at showcases and competitions in Poland and abroad (Austria, Belarus, Czech Republic, Germany, Slovakia, Italy), at which they won top awards, individually or together with their master. Śliwa even once showed up at the contest in Kopanica with his grandson Antoś, who was only 4 years old at the time, but already played the fiddle as an accompaniment to bagpipes. After the death of Wanda Woźna-Batory, the founder of the Perły/Pearls music group, he became a teacher at the Municipal Cultural Centre (GOK) in Siedlec, where he worked together with a group of adult musicians on the long-forgotten “singing kozioł” repertoire. 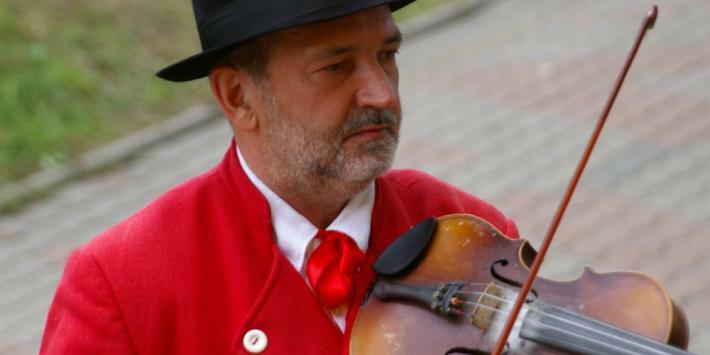 Leonard Śliwa was also a proponent of grassroots activities, which explained his involvement in reactivating the Association of Folk Musicians in Zbąszyń, the Folk Music Competition in Kopanica, or in reinstating the Bagpipe Feasts in Zbąszyń. He exercised his interest in his own personal roots and his exceptional energy in cooperating with the media, museums (Ochla, Poznań, Warsaw, Vienna, Zbąszyń) and the Kozioł Region Local Action Group. Permanent traces of these activities are numerous recordings (available on CD and DVD), exhibitions involving various bands, and reconstructions of local costumes and dialect, as well as in the biographical documentation of folk musicians. He would occasionally pop out an anecdote about the first central dozhinki in Warsaw, attended by a large group of Zbąszyń musicians led by Tomasz Śliwa or about excursions to Lusatian Fairs in Slepo, where women went to purchase colourful ribbons (szlajfki); the Slepo musicians, on the other hand, would travel to Zbąszyń in search of advice and instructions on traditional kozioł music. In spite of his attachment to his regional heritage, he was open to new initiatives for the revival of folk music, such as the Dance House (Dom Tańca) or New Afro-Polish Folklore (Nowy Folklor Afro-Polski) and strived to collaborate with them to present (together with his students) the musical traditions of the western Greater Poland region. He also contributed advice and his vast experience as a member of jury at competitions in Bukówiec Górny, Kopanica, Oravska Polhora, Śmigiel, and Zbąszyń. In his sporadic spare moments he would make quick sketches, of e.g. a figure of a bagpiper sitting on a tree trunk (presented as a proposal for the monument of a Young Bagpiper in Zbąszyń’s main square), compose Christmas Cheer, or write some additional stanzas for Świniorz (The Pig Keeper – a famous folk song from the Region of Kozioł). In other words: he was a very humble man of great passion and exceptional contribution – Master Leonardo from Zbąszyń.